Situated in Cologne's famous Gerling Quarter, this modern business centre provides a mix of private serviced office space and co-working areas. 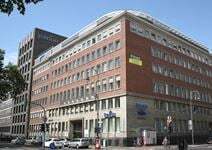 This very impressive building that the space inhabits is close to the Hohenzollernring and Friesenstraße areas of the city. The centre's rooms are fully equipped with technology, with 24/7 access, and there is a fully equipped kitchen for your convenience. Located just outside of Cologne, these twin two-storey buildings offers a fantastic workspace, with conference rooms, storage space and production facilities. In this centre, you can benefit from access to modern, well designed kitchenettes, and 24/7 access to the centre so you can run your business on your terms. There is a friendly on-site administration team, as well as parking. The nearest train station is a short 1-minute walk away, and there are many public transport connections within the surrounding area. Offering beautifully decorated and fully furnished offices, this convenient business address is a great place for professionals to develop and expand their business. With flexible terms and an all-inclusive fee you don't have to worry about the little things. Amenities offered within the building include high speed internet, printing facilities, support from an on-site team and more. The centre is easily accessible using public transport and by road. Found in the heart of the city, this business centre benefits from great local amenities including shopping, supermarkets, restaurants, bars and cafes. There are plenty of public transport links as well as parking facilities within walking distance. The business space redefines modern working with a range of offices including private units and coworking desks. Work spaces are bright and spacious, designed to promote productivity and a community spirit. The centre hosts a range of networking and business events where you can learn and share your ideas. Enjoy the view of the beautiful park right in front of the building and of the impressive Cathedral rising into the sky like an ancient giant. A selection of offices of various sizes is available in this first-class building, which offers virtual office services, meeting rooms and advanced videoconferencing facilities, café and a wide range of services. Located in the centre of Cologne, this building enjoys a stunning view over the city and excellent connections to the major motorway junctions. This new business center offers modern office infrastructure and spacious, fully furnished offices in two categories: in the executive offices, two comfortable, spacious workstations and in the team offices, space for up to four people. This business centre is characterised by excellent infrastructure links, an attractive environment with many fine restaurants and a variety of cultural activities and a sufficient number of parking spaces. A selection of offices of various size and meeting rooms are available to let in the heart of Cologne. Provided with state-of-the-art technology and advanced videoconferencing facilities, these office spaces benefit from first-class secretarial and administrative support offered by a professional and friendly team. Surrounded by famous amenities, well-known restaurants, hotels and shops, these offices are served by railway, underground and easily connected to the motorway and the airport. A selection of offices is available to let in one of the most impressive buildings of all Germany. Modernly designed and sophisticatedly decorated, this building offers a highly professional and elegant working environment, right in the centre of Cologne. The convenient location in the heart of the business and media district will positively contribute to the image of your company. Surrounded by various restaurants, hotels and shops, it enjoys a stunning view over the city and the Rheinland. It is easily accessible by motorway and public transport. This centre offers co-working desks just outside of Cologne. The office is accessible 24 hours a day so is well suited for any kind of working hours. There is access to an on-site meeting rooms as well as around the clock support from the friendly, approachable admin team who can take care of any queries you may have. Within walking distance you'll find many local amenities that you can make use of on either a lunch time or an evening. The centre boasts a large on-site car park for those who travel by car. If you use public transport the nearest station is only six-minutes away on foot. This landmark building, situated directly on the Rhine, offers stylish office spaces, modernly designed and decorated to a high standard. Equipped with state-of-the-art technology, they offer a highly professional environment. The exclusive location and the elegance of the building will contribute to the image of your business. The building benefits from excellent transport links and enjoys a stunning view over the city and the Rhine. A selection of office spaces are available to let in a landmark building in Cologne. Designed by a famous architect, this building offers an elegant working environment, which will definitely enhance the image of your company. Surrounded by numerous companies, museums and law firms, this centre is conveniently located in a dynamic and active area of the city. This site is perfect for businesses that want to establish a prestigious presence upon occupancy. This historical building offers a selection of offices recently refurbished to a high standard and equipped with the latest technology. There are conference facilities provided at this centre so you can convene meetings, networking sessions and training seminars. The centre offers a unique combination of modern equipment in a charming antique atmosphere. Centrally located, they are surrounded by a variety of services and are easily accessible. Just a short drive away, you can reach an abundance of museums, such as the Rautenstrauch-Joest-Museum. This is the perfect workspace solution for companies that value practicality and convenience, and for those looking for a home for their business that can provide much more than a well designed interior and motivating atmosphere. This business centre is close to Rodenkirchens centre and offers turnkey offices with flexible, all-inclusive packages. There is also access to spacious conference facilities, and on-site reception and clerical services. In the immediate area, there are also restaurants, cafes and bars to explore outside of work or during breaks. Modern offices and spacious meeting rooms, all sophisticatedly furnished, are available in a renowned commercial area of Cologne. These office spaces benefit from state-of-the-art technology, advanced videoconferencing facilities, lounge area and secure parking facilities. Centrally located in Cologne's business district, they are excellently linked to the airport and well served by public transport. Work with a stunning view- serviced offices in the centre of Germany's largest metropolitan area! 24-hour access and personal parking spaces, with an on-site management team to help your business operate as smoothly as possible. This business centre is located only 15-minutes away by tram ride to Cologne Central Station, meaning commuting is quick and easy. There are many excellent restaurants nearby for lunching or business meetings, as well as shops, banks and other facilities to explore outside of work. Located just 500 meters from a major highway, and boasting underground parking, this centre is close to all the amenities the centre of Cologne has to offer. Situated on the sixth floor of this eye-catching office development. Offering stunning views and high ceilings, this is a comfortable and efficient workplace. It is the ideal destination for businesses with both domestic and international clients. Offering modern and contemporary work spaces in an ideal location, this business centre boasts a range of solutions including private offices and collaborative coworking spaces. Work spaces come fully equipped with everything you need, with an on-site management team available to support you throughout the day. Your membership will include 24 hour access to the building so you can work at your own pace, including great high speed internet connectivity. The centre benefits from excellent public transport links with on-site parking available in a garage. Located in the city centre of Cologne this business centre offers a range of contemporary office solutions. You can choose from different modern workspaces which include private offices, coworking spaces and conference rooms. You can also benefit from this prestigious business address through virtual office options. The business centre also provides comprehensive business services including legal advice, HR services, tax/auditing services, business processes and much more. High speed internet, telephone lines and professional IT support will keep you connected and working efficiently. The centre benefits from excellent public transport links with easy access to the rest of the city. These working environments are spread over 9 floors with an impressive total surface area of over 9000m2. There are no lack of space for you and your guests, to make your visions and projects come true. Located by the Dome in Cologne, central station is only a 7-minute walk away from this centre making it very accessible with excellent public transport links. There are plenty of restaurants in the area, offering a bit to eat over your lunch break. The River Rhine is close-by, and tree-lined streets surround this prominent building, which has recently been fully refurnished. There are telecoms for efficient communication, as well as IT support so that you remain well connected throughout your occupancy. This easy to access modern business centre provides serviced offices in the heart of Cologne. The main railway station is 15 minutes by foot or 5 minutes by car and Cologne-Bonn Airport is about 25 minutes away by vehicle or public transport. This is a unique opportunity to let a selection of offices of various sizes in the business district of Cologne. Available at flexible rental terms and very convenient prices, these offices will accommodate needs of companies and entrepreneurs. The offices are provided with meeting and conference rooms, lounge areas, kitchens, on-site bistro and parking facilities. Surrounded by a variety of amenities, they benefit from excellent connections to the Cologne-Bonn airport and numerous public transport routes. Less than 5km from Cologne-Bonn international airport, these serviced offices are sleek and stylish and start from just 15m² in size. There are also meeting rooms and conference facilities on each floor. The Virtual Office service provides a prestigious business address for your enterprise, whilst allowing you to retain autonomy and mobility. Such spaces are available at significantly lower costs in comparison to physical offices and include mail forwarding services as well as local telephone and fax numbers.